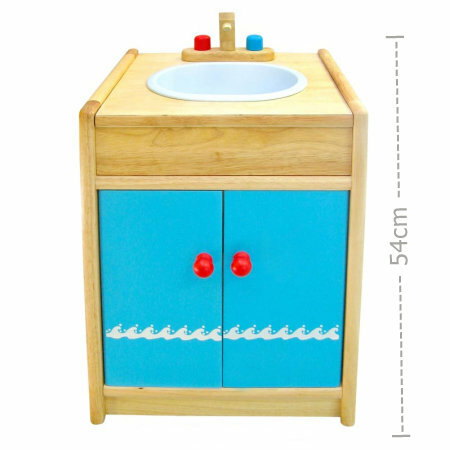 Wooden Kitchen Sink With Cupboard is a great piece of kitchen toy furniture which will add to any play kitchen. Beautifully finished this sink has a usable plastic bowl, pretend hot and cold taps and two opening cupboard doors. This toy is the perfect size at 54cm high, 40cm Wide and 36cm Deep. A wonderful toy to encourage pretend play this sink is sturdy enough to last in a kindergarten environment with multiple chefs. Learning to wash-up... they can never start to young!. We like this because: "Beautifully finished and very strong a great roleplay toy."